‘To leave so much unsaid was a huge risk for me to take. I was very nervous about it,’ says MJ Hyland, gazing out of a hotel window at Edinburgh’s skyline, where past and future collide as never before. She is talking about her first novel, How the Light Gets In, which Canongate Books has snapped up following its appearance in Australia last year. Jamie Byng’s radar is working well. This intriguing and disturbing work shimmers with edgy brilliance and insistently demands an intuitive, imaginative response from the reader. It follows three months in the life of Louise Connor, a gifted sixteen-year-old Australian exchange student whose wayward behaviour explodes the complacency of her middle-America host family. All sorts of things are suggested that the author never actually spells out. Lou’s host family, the Hardings, await her at Chicago airport, smugly confident of what they have to offer in the way of lifestyle. They welcome her into their comfortable suburban mansion, fifteen tastefully decorated rooms smelling dewy fresh, the embodiment of Lou’s American dream. She is sure this is where she wants to be, a world away from the claustrophobic squalor of her impoverished home and the family she never wants to see again. She has mainlined the myth of America as bringer of freedom. Fuelled by adoption fantasies, her secret desire is to find a permanent home with a rich family, to live someone else’s life. As a writer she plays with the differences and divisions people erect between themselves, and the way things are constantly shifting and provisional. More interested in people’s madnesses than in their sanity, or their pretence at sanity, she describes Lou as a psychological burns victim. Hyland’s own childhood years were scarred by domestic violence and poverty. Now 35, she was born in London of Irish parents. Her father was an alcoholic petty criminal, forever taking refuge in sentimental fantasies of reprieve from self. Her mother, crippled by polio, seems to have been excessively vulnerable to his empty promises and failed to extricate herself from the marriage until their two children had grown up. The family ricocheted between Ireland and Australia in search of a new start, twice times by the time Hyland was eleven. But wherever they were it was always the same, apart from the weather. Her father drank night and day, taunting his wife about her ‘chicken legs’ and claiming her appearance was the reason he hit the bottle. Sometimes he flung his dinner at the wall. Other times he beat his son or tried to strangle his wife. As a teenager Hyland began to intervene, usually with a knife snatched from the kitchen drawer. Some instinct told him she meant business and he never made the mistake of taking her on. She says he made her ‘mad enough to be a writer’. Hyland is a survivor. In her late teens she pulled herself out of a spiral into drug abuse and delinquency and applied herself to getting an education. She studied law at Melbourne University, enjoying its ‘internal disciplines’, and landed a job with a leading law firm. Remarkably, she describes this as the worst time of her life. Then came eight years’ editorial involvement with a literary magazine called Nocturnal Submissions and a post teaching Creative Writing at Melbourne University. Her aversion to stating the obvious leaves room for the reader to surmise about Lou’s past experience. Hints and suggestions are sounded with telling subtlety, lending the book a musical quality. Uncertainty is the refrain. Hyland’s territory is alienation, and she is at home with her material. ‘I write from the five senses. When I imagine something, I can smell when it’s right. I trust that instinct. My personal obsession is to make the reader feel they’re inside a character’s head. I mean, completely. Maybe I should design video games,’ she adds dryly. Even at the outset of the novel, when possibilities are as virgin white as the bed linen in Lou’s attic room to die for, menace insinuates itself. Margaret, the host mother, friendly and tactile, is oblivious to Lou’s recoil. Why does Lou so hate to be touched? Is it because she has experienced sexual or physical abuse? This might be the inference, or it might not. In a sexual encounter with James, the Hardings’ teenage son, she pretends to be asleep, pretends she’s not really doing anything. She tries to lie her way into people’s affections, steals money to buy gin and cigarettes, feels dirty and rotten, yearns for purity, makes endless lists of pacts and promises to herself. It seems impossible to get out what she wants to say. Lou suffers from insomnia and incessantly craves sleep – but she can only ever sleep in somebody else’s bed. Her sense of self is unreliable, something Hyland knows from the inside. ‘Perhaps that’s what makes it possible for me to write,’ she says. ‘My life changed so often that I don’t have a sense of continuous self. I didn’t stay in any one school for more than two years, any one home for more than three years.’ She used to think that other people had a stronger thread of identity, but now reckons it’s as different as people are different. Hyland started to write when she was seventeen. She had been taken in by a school teacher when things got too messy at home and discovered the short stories of Gogol. She fell in love with him. ‘Reading ‘The Overcoat’ was the closest thing to mind-reading. I felt suddenly less alone.’ But having crossed the line and become a writer herself, this sense of connectedness now strikes her as a fallacy. ‘However honest the book, it’s artifice. And so, how can anyone see me?’ Sustaining myths are made to be fractured. There’s a crack in everything, right enough. And as Leonard Cohen says, that’s how the light gets in. 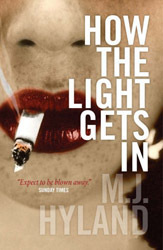 How the Light Gets In by MJ Hyland is available from Canongate Books (ISBN 1841956112 £6.99 PBK). This article first appeared in the Glasgow Herald.